Are your kids obsessed with waffles? Or maybe you want them to eat more waffles (which is always a great idea…). Well, we have reviewed some of the best kids waffle makers awesome to help you choose which one you would like to buy for your kids (or for the kid inside you!). From Mickey to Captain America, there is a perfect waffle for everyone! Let’s start off with a classic- Mickey Mouse! Everyone knows Mickey and all young kids love him (Disney is the happiest place on earth after all!). Making waffles in the shape of Mr. Mickey Mouse himself seems like an awesome idea so we tested the Mickey Mouse waffle maker ourselves to see how it works! Quick to set up (you literally just have to plug it in), the waffle maker is hot and ready for batter after about 5 minutes. About 3/4 of a cup of waffle batter fills Mickey’s face and if you fill it up too much, there is a nice deep groove in the waffle maker plates that will catch any overflow batter. There is no light on this Mickey waffle maker to tell you when the waffles are done so you have to take a peek inside to see if they are the golden color you are looking for. It took about 4 minutes for our waffles to be perfectly golden brown. The waffle came out of the machine cleanly and did not stick to the plates at all. When cutting into the waffle, it did have more of a pancake consistency rather than a crispy waffle. However, the shape was perfect, it cooked quickly and was a huge hit with my 2 year old! And for about $25, anything that ensures that my kid eats breakfast is a winner for me! If you’d like an even more detailed review of the Mickey Mouse Waffle Maker, you can watch our video or check out Amanda’s in-depth review below to see the waffle maker in action! Calling all superhero fans! This Captain America Waffle Maker is one of the best kids waffle makers I’ve seen. It’s great in more ways than one! This waffle maker has two different top and bottom plates so one side of your waffle will be a super cool Captain America Shield while the other side will be a standard Belgian Waffle! Having the Belgian waffle grid on the back of the waffle make the waffle is crispy and not like a pancake at all -Captain America waffle lovers rejoice! With no drip tray or indicator light to tell you when the waffle is cooked, this machine is straight forward and easy to use- plug it in, grease it up and go! The waffles take about 4 minutes to cook once the machine has heated and uses about 1 cup of waffle batter which means you get a massive waffle out of this little machine. The waffle we made came out nice and crispy over all but did have some spots that were darker than others. Overall, the nice outside design of the machine, the small size and the nice big Captain America waffle make this waffle maker worth the $25. Watch our Youtube review video here to see exactly how the Captain America Waffle Maker works or read a more in depth blog by Amanda Bochain at the link below. I still think this is a great option, especially for boys, when looking for kids waffle makers. With a sewer grid on one side and a snarling teenage mutant ninja turtle on the other, this kids waffle maker is fierce! Plug in this Nickelodeon waffle maker and you are ready to go- the turtle shell shaped light will let you know when the waffle iron plates are hot. Upon opening the teenage mutant ninja turtle waffle iron to pour in the batter, your might notice that the waffle hinge is a little shaky and might not feel as sturdy as those more expensive waffle irons. As a novelty shaped waffle iron, this is kind of expected but hopefully won’t impact our waffles! Pour in about 1/2 cup of batter and after just a few minutes of cooking, open up the waffle plates to find a golden brown teenage mutant ninja turtle. While there is no light to depend on to tell you when the waffles are done, the steam pouring out from the sides when you begin cooking the waffles will slow down and stop when they are done- no steam=cooked waffles! At about $25, this teenage mutant ninja turtle waffle maker does as it promises and produced some nice crispy waffles in the exact design that is shown on the box. The waffle is a little thinner than most Belgian waffles and the machine is slightly wiggly but the waffle tastes great and is sure to please all of those teenage mutant ninja turtle fans! Most likely due to the incredible popularity of Frozen the movie, Disney has made several waffle makers to satisfy its fans. First, there is a Frozen waffle maker with a picture of Elsa and Anna on the top of the machine which makes Belgian waffles with a snowflake pattern. The next Frozen waffle maker makes a waffle in the shape of Olaf and has an image of Olaf on top of the waffle maker. There are also two more Frozen waffle makers that make snowflake waffles- one in the complete shape of a snowflake and the other makes small snowflakes that can be cooked onto sticks. I am going to focus this review on the most popular Frozen waffle maker which makes the Olaf shaped waffle. While the various snowflake waffles are cool, we want to really please all those Frozen fans and a basic snowflake just won’t do- good thing we have Olaf! The Olaf Frozen waffle maker is fairly small and compact. Besides the non stick waffle iron plates, the only extra feature here is a snowflake shaped light to let you know when the plates are hot- no drip tray, no heat dial, just straight forward waffle making! Now, just like you would build a snowman outside, you are going to have to build your Olaf waffle once it is cooked. There is a separate section of the waffle iron for Olaf’s arms, body and head. You could try to fill each tiny crevice with waffle batter or just pour the batter across the whole waffle iron and cut away the pieces later. The waffle only takes about 4 minutes to become golden brown and then you can flip it out on a plate. Cut away the extra waffle batter, leaving only the Olaf shapes waffle pieces and then assemble him on the plate! Maybe let your kids assemble the Olaf- sometimes it is okay to play with your food! The waffle came out with a consistency of a pancake rather than a crispy waffle but it definitely looks like Olaf! There is no doubt that this Frozen kids waffle maker will make your little Frozen fans happy- just keep in mind that assembly is required (but for around $18, its worth the extra effort)! Which is the Best of the Kids Waffle Makers? Well of course the answer to that question partially depends on whether your child is a boy or a girl, what his or her favorite characters are, and how much you’re willing to spend. I think all of the kids waffle makers reviewed here could do the job nicely and bring some fun to your kids at breakfast time. However, these are the only ones, and there are tons of kid friendly waffle makers out there. But these four are a great place to start. 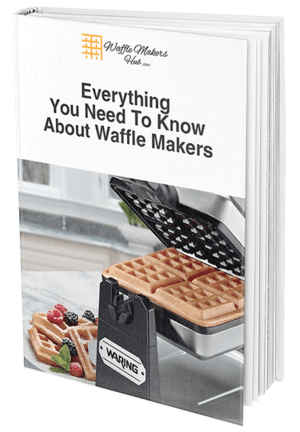 If you are looking for an everyday waffle maker, check out our Ultimate Buying Guide which will give you some great reviews on this year’s best waffle makers. Also take a look at our recipes to find a few ways to make amazing waffles!